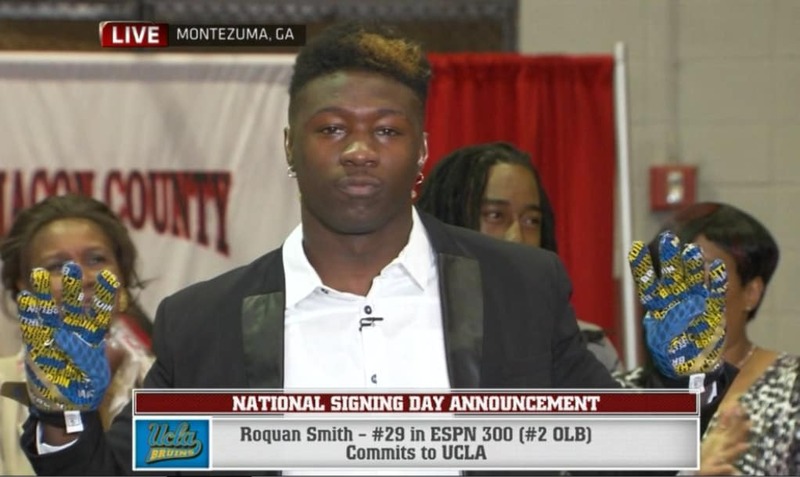 Earlier today live on ESPNU, four-star linebacker RoQuan Smith of Montezuma, GA committed to play for the UCLA Bruins. However, Smith still has not sent in his National Letter of Intent to UCLA. Why? A couple of reasons. First, Smith said in an interview with UGASports.com immediately after his announcement that he was 55% Georgia, 45% UCLA earlier in the morning. He was still torn between the two but went ahead and made the commitment to UCLA. Second, some interesting news was broken by Fox Sports shortly after Smith’s announcement. UCLA Bruins defensive coordinator Jeff Ulbrich is reportedly leaving to become the linebackers coach with the NFL’s Atlanta Falcons. According to the AJC, Jeff Ulbrich is the reason that RoQuan Smith committed to the Bruins. Harold also mentioned that it was the UGA coaches that alerted RoQuan Smith to the rumors that UCLA’s DC was leaving for Atlanta. Apparently UCLA failed to mention any of this to RoQuan and may have been hoping to suppress that information until after RoQuan had sent in his letter of intent. In any event, RoQuan Smith is still available and could end up with the Georgia Bulldogs. The nation’s No. 1 recruit and UGA signee, Trent Thompson, reportedly drove 80 miles to Montezuma to help convince RoQuan to come to Athens. In addition, UGASports.com reported that just about the entire 2015 UGA recruiting class has been texting him trying to get him to join the Dawgs. But Georgia will also have to fight off Michigan and Texas A&M to gain Smith’s signature. Both were finalists for RoQuan Smith along with Georgia and UCLA. Georgia currently has 28 signees. Five-star athlete Terry Godwin, a UGA Commitment, is set to announce his final decision between Georgia and Auburn tonight around 6:20pm on Fox Sports Net. Georgia’s 2015 class is currently rated 5th by Scout, 7th by Rivals, 9th by ESPN, and 10th by 247Sports. Macon County head coach Larry Harold told the AJC that RoQuan Smith will take “a couple of days” to decide what school he wants to sign with.